At The Orchard we try to provide a warm, friendly environment in which you can enjoy your time away from it all. Our facilities are designed to be family friendly but not overly lavish. Experience the joys of the great outdoors with the basic comforts of home! New toilet and shower facilities for 2017! New indoor/outdoor kitchen and washing up facilities for 2017! Wood available to buy by the barrowload, all from a sustainable local source, plus kindling and of course marshmallows! Free fishing – in either the river Deben (rod licence required) or day fishing is available in the campsite fishing pond- Carp, Roach, Tench and Bream. Landscaped BBQ area, free to use, or you can use your own BBQ at your pitch. 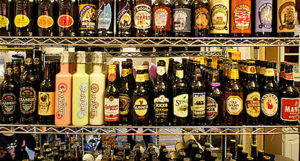 Off Licence on site stocking over 200 beers and wines from around the world. Fresh hand carved top rump steaks, daily deliveries of fresh croissant and bread from a local artisan baker, a superb range of Suffolk produced jams, pickles, sauces, drinks and fresh meats – all our prices are low and often lower than the big supermarkets.